Changed from stock 17 inch to aftermarket 19 inch. Wheel Specs: HR Racing Alloy (Lexus ISF Replica) 19x8, Offset +45 , PCD 5x114.3 Machined Centrebore to 67.1mm (to fit the Mazda 6). We liking it. Image Attached. No image. Post it to photobucket and upload the IMG link. How has the steering feel/response and ultimate grip changed? My wife and I are no race drivers, but there has been no noticeable negative affects to those (steering feel/response and handling) after the change out. Ride may be ever so slightly stiffer due to the lower profile tires but have not settled on final pressure yet, currently 42psi cold, and this may be high (but wife and kids have not commented, so all good for now). Grip feels good, but I would not say better (we have chosen comfort tires, perhaps performance tires would show their pedigree in this regard). Not driven in wet yet. The FD2 tires do produce less road noise though than the Toyo T1 Sports they replaced, go figure. All in all we a happy with the change. Look forward to seeing what other wheels get rolling under other new Mazda 6s. Deleted. Posted in wrong thread. Last edited by calvin_gsc; 03-28-2013 at 11:30 PM. RTX Envy 18 x 8, 42 offset. 225/50R18 General Altimax tires. I do like the graphite wheel look on these cars. Might have to look that route after all. Has your Mazda ever climbed a mountain? 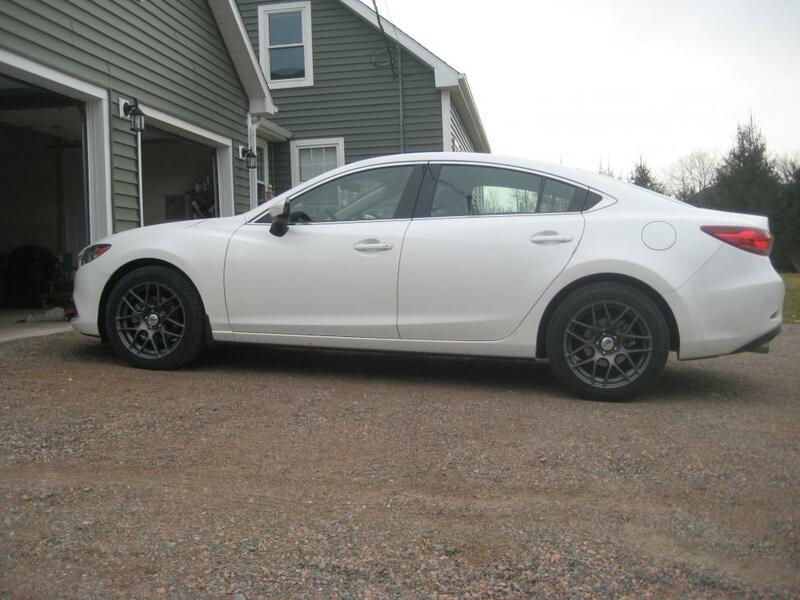 One thing I gotta say that really helps with my budget is that I love the design on the stock rims for the '14 Mazda6. A cool design that works well with the car's lines. Of course, what fun would a car be if you couldn't cu$tomize!